Watch the video: Teachers Talk Policy by Kaitlin Pennington and Lauren Santa Cruz. View the yearbook: The Teachers-as-Policy-Analysts Yearbook by Kaitlin Pennington. In the past five years, a number of grassroots groups and fellowships have emerged across the United States with the goal of giving teachers a greater role and a stronger voice in improving everything from the professional practice of teaching to the way the profession is governed. These groups are often called “teacher-voice organizations,” and in many cases they are established with the aim of giving practicing teachers direct access to influence the policies that affect their practice. While teachers do not have a monopoly on educational wisdom, their first-hand perspective gives them a unique and critical vantage point from which to assess the efficacy of educational policy decisions. Omitting them from this arena seems an approach destined to create more problems than it solves. I think these organizations will help raise teacher voice, and we’re going to clearly partner with a number of them to bring their voice into the union and also to think about how to use those voices more strategically in the policy debates. … And I’m talking about voices of practicing teachers that maybe wouldn’t have been involved in the union [without teacher voice organizations]. Many teacher-voice groups are working under the assumption that involvement in policy discussions also affords teachers leadership opportunities not yet seen in our current education system. School districts experimenting with career ladders for teachers have begun to consider working with the teacher-voice organizations to increase opportunities for teacher professional development. 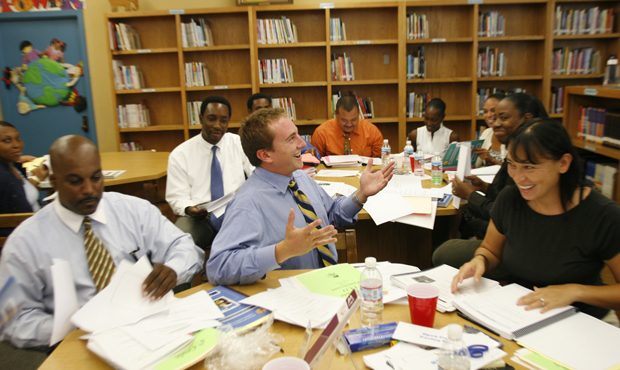 Officials of the District of Columbia Public Schools, or DCPS, have added teacher-voice-organization opportunities such as the Hope Street Group National Teacher Fellowship, the Teach Plus Teaching Policy Fellowship, and the U.S. Department of Education’s Teaching Ambassador Fellowship to their list of leadership-training experiences in DCPS’s career-ladder program for teachers known as the Leadership Initiative For Teachers, or LIFT. For some leaders of the new teacher-voice groups, the inclusion of their leadership opportunities as part of what districts consider to be official training begins to fulfill one of the goals of teacher-voice groups: elevating the teaching profession by providing teachers with leadership opportunities outside of the classroom while continuing to teach. Each organization or fellowship was formed using a unique grassroots model. Teacher-voice organizations and fellowships operate under the premise that teacher voice is not monolithic. Despite differences in structure, all of these teacher-voice organizations and fellowships are working on ways to professionalize the teaching profession. Technology is integral to all organizations and fellowships either as a driver of programs offered or as a link to connect participants. All teacher-voice organizations and fellowships respect the history of teachers unions and see them as powerful players with which to partner. Teacher-voice organization and fellowship membership is diverse. Funding often comes from outside sources. Organizations and fellowships overlap in some policy interests, but the mix is unique to each group. While it may not be possible at this moment to determine the impact of teacher-voice groups given their short histories and size, this paper details the role that teacher voice is playing in education reform, at a time when the teacher-voice movement has picked up speed and is growing in importance. The following analysis of teacher-voice organizations and fellowships in the context of what some are calling a teacher-voice movement uses qualitative data collected through interviews with education-policy scholars and academics, leaders of teacher-voice organizations and fellowships, teachers-union officials, and teachers. (The full list of respondents is included in the appendix.) Research consisted of a review of scholarly and think-tank research and relevant news and journal articles on the role of teacher voice in education policy. The particular teacher-voice organizations and fellowships were selected because they are influential in the size and scope of their work, though the list is by no means comprehensive and it is possible that relevant organizations and fellowships are not mentioned. The organizations and fellowships are presented by the size of their membership.